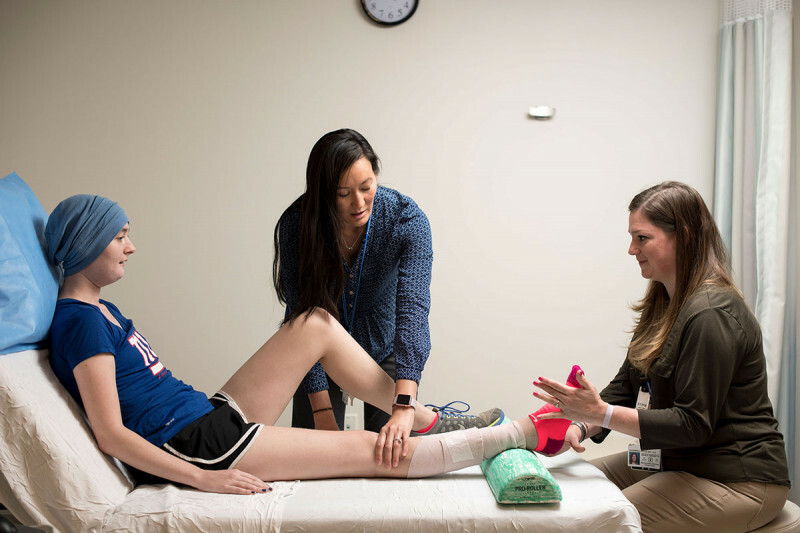 Memorial Sloan Kettering physical therapists can help patients manage pain due to cancer and its treatment. It is possible to manage pain effectively in most people with cancer or with a history of cancer. Although cancer-related pain cannot always be relieved completely, therapy can lessen pain for nearly all people with cancer. Effective management of pain and other symptoms improves quality of life throughout all stages of the disease. No one should hesitate in telling their doctors or nurses if they are feeling pain. In fact, pain can interfere with the effectiveness of cancer treatment, so it is very important that members of a care team know about any pain that their patients may be experiencing. The diagnosis, stage of disease, response to pain and treatments, and personal likes and dislikes are different for each person. Because of that, management of cancer pain at MSK is tailored to the individual in order to be as effective as possible. All MSK patients are regularly screened for the presence of pain in both the hospital and outpatient settings. Patients in the hospital are asked every four hours if they have pain. They are encouraged to report pain to their nurse or doctor whenever it occurs. Intensity is measured on a scale of zero to ten. No pain is rated as a zero. The worst pain imaginable is rated as a ten. Every effort is made to provide relief and ongoing assessment. Over the past three decades there have been many scientific advances in understanding and treating pain. Researchers have identified pain receptors and clarified how pain signals are transmitted to the brain. These findings have resulted in more-effective therapies for treating pain in people with cancer. Surgery, radiation therapy, chemotherapy, and immune therapy may rid the body of some or all of the underlying cancer. This can provide substantial relief from pain. In addition, new minimally invasive treatments can destroy tumors without surgery. Surgery and radiation therapy can be performed strictly for palliative purposes as well. This means the goal of the surgery is to reduce pain and other symptoms so people with cancer can sustain their quality of life. Surgery may be used to prevent or control pain-causing cancer complications. These include bowel obstruction, compression of the spinal cord or peripheral nerves, and compression of organs. Palliative surgery and radiation are focused on comfort. They are used primarily for people with advanced cancer. Pain can be divided into different levels. Non-opioid drugs, such as acetaminophen (Tylenol®), may provide some relief. Nonsteroidal anti-inflammatory drugs (NSAIDs), such as aspirin and ibuprofen (Advil®), can as well. Medications like these can help many types of mild to moderate pain. These include muscle pain, bone pain, and the pain caused by some incisions. Non-opioid pain medications may be prescribed in combination with opioids and other therapies for greater pain relief. Opioids are highly effective medicines for relieving cancer pain. These include morphine, fentanyl, codeine, oxycodone, hydromorphone, and methadone. Some people fear the potency of morphine in particular. They believe it is the most powerful opioid. This is not the case. They may also worry about becoming addicted, but morphine is a safe, well-tolerated drug. When pain arises, doctors usually start patients with an immediate-release medication. Later, they’ll switch them to an extended-release form that needs to be taken only twice a day. Opioids may be combined with non-opioid drugs. For example, acetaminophen or NSAIDs can be used along with opioids to treat moderate pain. Opioids can also be used with other drugs and therapies for severe pain. When other drugs are used, they are called adjuvant analgesics. People rarely become addicted to powerful pain medications such as opioids when they are prescribed for cancer-related pain and taken appropriately. Opioids may be prescribed at any stage of treatment depending on need. If a doctor wishes to reduce the amount of opioid being used, it may be possible to manage pain with a lidocaine patch (Lidoderm®) on the painful area. There is no need to tough it out early in treatment. People starting a therapy for cancer do not need to be concerned that strong pain medicines won’t be effective if needed later on. Increasing doses of opioids can be used for years without addiction or psychological dependency. When the need for pain relief subsides, physical dependence can usually be managed without withdrawal symptoms. Doctors will taper the opioid before discontinuing it completely. People with cancer very rarely seek drugs beyond what is needed to control pain. Sometimes a doctor may prescribe a quick-acting, potent medication, such as oral morphine. This is called a rescue medication. A person with cancer-related pain can then have this medication available if their pain continues despite their normal pain relief medicine. Rescue doses act quickly and leave the body relatively soon. They are usually prescribed in addition to the medication taken regularly for persistent pain. Typically, a nurse will administer these medications, but patients may do it themselves. In that case, it is called patient-controlled analgesia, or PCA. The patient can determine the amount of pain medication that is given by pressing a button on a computerized pump. Several drugs besides non-opioids and opioids have been found to provide pain relief in specific situations. Many of these drugs are better known for treating conditions other than pain. They include antidepressants, anticonvulsants, and steroids. These drugs are now are being used with excellent results to manage cancer-related pain. Some of them have been found to help relieve certain types of pain. For example, tingling and burning sensations and pain caused by inflammation (swelling) can be treated by adjuvant analgesics. For acute and postoperative pain and some chronic pain problems, temporary nerve blocks (neural blockades) can provide short-term relief. In this procedure, a doctor injects a local anesthetic into or around nerves or below the skin in the area where there is pain. The anesthetic interrupts the transmission of pain signals to the brain. This may provide relief for up to several hours. In a procedure called a neurolytic block (neurolysis), a doctor injects a substance — most often ethyl alcohol or phenol — into a nerve or into the spinal fluid. This destroys the nerve tissue in the pain pathway. This technique usually has a long-lasting or permanent effect. Nerve blocks work best for pain that occurs over a limited area. Generally, this involves one or two specific nerves. For pain that is more widespread, it is possible to interrupt pain signals using epidural or intrathecal pumps. (“Epidural” refers to the space just outside the spinal cord’s outer membrane. “Intrathecal” refers to the space between the sheaths covering the spinal cord.) These pumps are either carried in a pouch or placed under the skin to deliver medication continuously to broad areas. Some pumps have a button to push to receive additional medication. By delivering medicine directly to the nerves causing pain, less medication may be needed. For many people, this can mean better pain relief with fewer side effects. Ziconotide is a powerful drug commonly used in epidural and intrathecal pumps. It is derived from the toxin of a cone snail. This drug was approved by the US Food and Drug Administration in 2004 for use with severe, chronic pain. It is effective in up to 50 percent of people but may not be appropriate for everyone. Most cancer-related pain can be effectively managed with medication. When drug therapy does not provide adequate relief or when the side effects of medications become a problem, nonpharmacologic approaches are often effective. In some instances in which pain is not controlled by more conservative means, pain can be interrupted (ablated) by neurosurgery. The most common procedure is called a cordotomy. It disables the nerves in the spinal cord that are responsible for conducting pain impulses to the brain. Neurosurgical techniques are also sometimes used to implant drug-delivery devices and to stimulate nerve fibers to prevent pain. Focused psychological care is an important part of effective pain management. Short-term psychotherapy, structured support, and cognitive-behavioral therapy can help people develop useful coping skills. These approaches can further enhance the effectiveness of other treatments. MSK’s Department of Psychiatry and Behavioral Sciences pioneered the development of psychiatry in the cancer setting. Our doctors and nurses are committed to the psychological and psychiatric care of people with cancer and their families. We provide evaluation and management of the major psychiatric complications of cancer and its treatment. We also have counseling services for the problems of coping with cancer. Patients and family members who would like to have a consultation with a psychologist who specializes in coping with pain can call 646-888-0200. Complementary approaches to pain relief may be integrated into therapy at any stage of treatment. These complementary therapies supplement medical pain-control methods. They include relaxation techniques, meditation, movement therapies, acupuncture, and massage. Techniques such as these can help relieve acute pain during certain procedures, acute postprocedural pain, and some forms of chronic pain. MSK’s Integrative Medicine Service offers individual therapies and group classes using the best of these complementary approaches. Services and programs offered by the Integrative Medicine Service are open to all people with cancer. Patients in the hospital at MSK can arrange for services by calling 646-888-0888.